Since I've first installed ConEmu after reading Scott Hanselman's excellent blog post about it, I've been using it for all my console needs. Even the command prompt improvements in Windows 10 haven't really excited me all that much. There was an exception, though. I've never really made the effort to make Git work in my system command prompt. SourceTree seems to cover most of my needs, when interacting with Git. When I really needed to use it from the command line, I settled with its embedded terminal support. Now that I've finally decided to take care of this, I collected all the steps I took in this blog post for future reference. I assume it might prove useful to others, as well. Since SourceTree comes with its own embedded installation of Git, the first step was actually installing standalone Git. 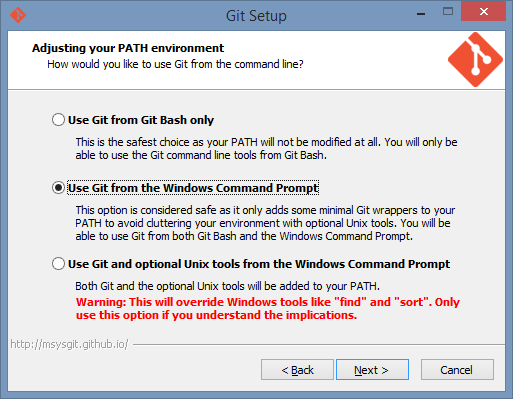 I kept most of default options in the installer, except for the PATH variable - I wanted Git to be included in the path so that I could use it from everywhere. After saving the changed file and reinitializing the session again (. $PROFILE, remember?) the error was gone. This was the last time I had to enter my credentials. 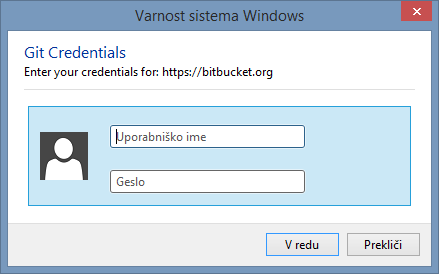 They are now safely stored Windows Credential Store and retrieved from there whenever Git communicates with my remotes. Now, I'm truly satisfied with my setup. Thanks to Phil Haack, brianary, and Joshua Gall for their posts which where the source for all of the above.